When Hedgy the hedgehog started suddenly bleeding somewhere from her hind end, her family was worried. They brought her in through the Emergency service at NorthStar VETS where Dr. Stacy Rebello, Medical Director of the Emergency and Critical Team, examined her. After examination, it appeared that the bleeding was either coming from her urinary system or her reproductive system. An ultrasound was done by Dr. Kate Kerrigan, of the NorthStar VETS Radiology team, to look at these organs and found that the reproductive system looked abnormal and was the likely source of the bleeding. Dr. Matthew Grootenboer of the Avian and Exotics team had bloodwork performed to see how anemic Hedgy might be since she was bleeding. He found that her packed cell volume (PCV), a measure of the proportion of blood that is made of the blood cells was only 10%. In a normal hedgehog, that number should have been closer to 30-55%. Knowing Hedgy would need further care, Dr. Rebello handed the case to Dr. Kristin Britton of the Avian and Exotics team the next day. 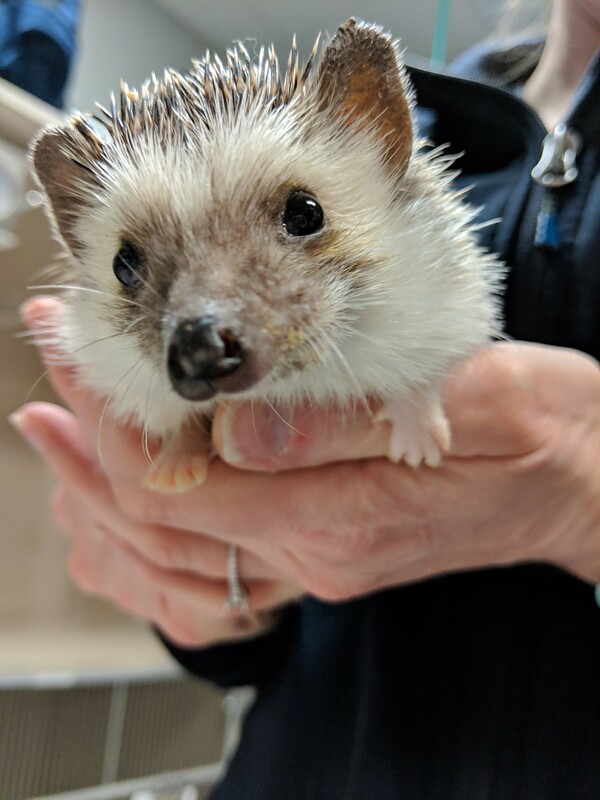 The level of Hedgy’s anemia was concerning and a blood transfusion was necessary before surgery could be attempted to remove her abnormal reproductive system. Hedgy’s family reached out and found a breeder, who brought in Meatloaf, another hedgehog who was able to donate blood. Meatloaf’s blood was carefully collected under anesthesia and a special test was performed to make sure his blood would be a good match for Hedgy, and luckily for her it was! Dr. Britton performed the blood transfusion which went very well, but due to Hedgy’s continued bleeding her PCV was only up to 13% the next day. Surgery, although risky due to her anemia, was the next step to stop the continued bleeding once and for all. In surgery, Dr. Britton removed the abnormal reproductive system with special surgical tools to avoid any bleeding. Hedgy recovered well from the procedure and no further bleeding was seen! The reproductive system biopsy revealed a condition called Lymphoplasmacytic Endometritis which causes the tissue in the reproductive system to become thickened, causing excess secretions and risks for uncontrolled bleeding. There was also an abnormal polyp in Hedgy’s reproductive tract, which was a benign tumor, but her polyp was another source of her bleeding. Hedgy went home after surgery where she was reported to be doing well. At her 1-week recheck, Hedgy’s PCV was 23%, much closer to normal range, indicating that the surgery was a success and Hedgy would continue to make new red blood cells to correct her anemia. Hedgy should have a great life going forward with her wonderful family! Learn more about the Avian and Exotics service at NorthStar VETS. 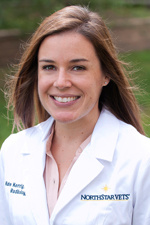 Dr. Kristin Britton attended veterinary school at Ross University School of Veterinary Medicine and graduated in 2012. She went on to complete a small animal rotating internship at the Animal Emergency Medical Center in Torrance, CA. She was then accepted into a wildlife specialty internship in medicine and surgery at The Wildlife Center of Virginia. 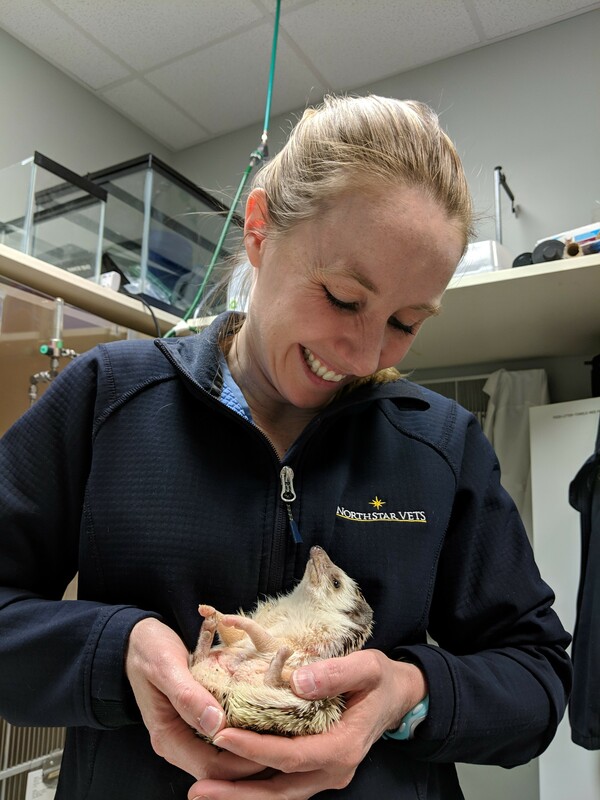 Dr. Britton then traveled to Saskatoon, SK to complete a wildlife, exotic, and zoological internship at the University of Saskatchewan’s teaching hospital. She then accepted an ABVP Avian Residency position at the Veterinary Center for Birds & Exotics in Bedford Hills, NY. 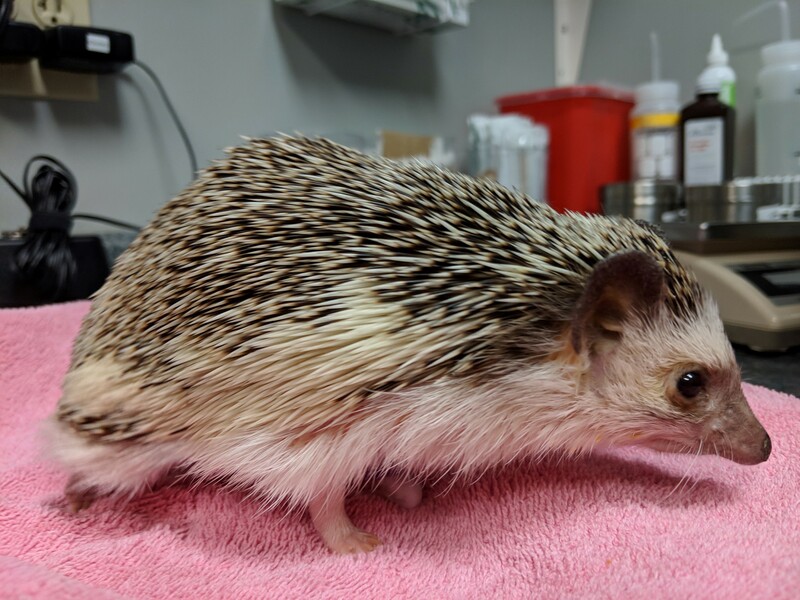 Dr. Britton has worked with a wide variety of exotic pets, wildlife, and zoological animals ranging from as small as a vole to as large as a whale. After finishing her residency, she has landed here at NorthStar VETS where she’s excited to continue to practice high quality medicine with a wide range of exotic patients! Dr. Britton is originally from California, but currently lives in Morrisville, PA. She shares her home with her boyfriend, and a charming grumpy old Shih-Tzu named Riley. She likes to keep active and loves hiking, scuba diving, kayaking, and exploring all that the East coast has to offer. 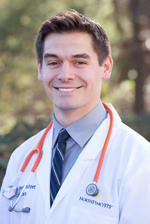 Dr. Matt Grootenboer attended veterinary school at the University of Pennsylvania and graduated in 2015. He went on to complete an internship in small animal medicine at Oradell Animal Hospital. From there, he traveled to Florida to complete an internship in exotic animal medicine at Broward Avian and Exotic Animal Hospital where he appeared on the National Geographic TV show Dr. K’s Exotic Animal ER. He has returned to his home state of New Jersey to continue working with exotic companion animals at NorthStar VETS. An extension of his passion for exotics is his interest in zoo animals and wildlife. He has worked with a variety of unusual species throughout his career, including kinkajous, kangaroos, and giraffes. Dr. Grootenboer is a firm believer in the idea that all animals are equally important no matter how small or short-lived and to their parents these pets mean as much as a dog or cat would. He lives in Princeton, NJ with his cat Penny, rat, and hamster. When not working, Dr. Grootenboer likes to stay active whether that means going to the gym or for a bike ride/hike. He also likes to play the drums in his spare time. Each fall Dr. Grootenboer becomes a bit difficult to reach on Sundays as he cheers for his favorite football team, the Miami Dolphins. 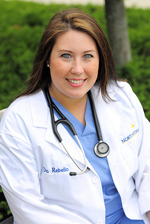 Dr. Rebello is a New Jersey native who completed her undergraduate degree in biology at Fairfield University while working as a technician at a local veterinary clinic. She earned a master of science degree in theriogenology, studying equine placentitis and placental drug transfer at the University of Florida. She continued her studies at UF and was awarded her doctor of veterinary medicine degree in 2008. Dr. Rebello returned to New Jersey for an internship in small animal medicine and surgery at Garden State Veterinary Specialists in Tinton Falls. She joined the NorthStar VETS emergency department in 2009, where her clinical interests include trauma care and perioperative management of surgical emergencies. Learn more about the Radiology service at NorthStar VETS. 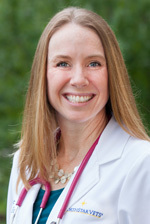 Dr. Kerrigan, originally from Connecticut, is a graduate of the University of Illinois College of Veterinary Medicine. She completed a rotating internship at the University of Pennsylvania and returned to Illinois to complete her residency in diagnostic imaging in 2014. During the course of her residency, she also completed a Master’s degree in veterinary clinical medicine. Dr. Kerrigan joined NorthStar VETS in 2014. Her clinical interests include CT angiography, and emergency imaging. This entry was posted in Pets, Veterinary Medicine and tagged Avian and Exotics, hedgehog, Katherine Kerrigan DVM, Kristin Britton DVM, Lymphoplasmacytic Endometritis, Matthew Grootenboer VMD, NorthStar VETS, Stacey Rebello DVM, Veterinary Emergency, Veterinary Radiology. Bookmark the permalink.